Thump and wallop were noted as the prominent features of a Rega RP8-charged mid-afternoon romp through a 2LP vinyl take on Aphex Twin’s I Care Because You Do; a muscular and meaty KEF LS50 listening experience. Nine hours later and we were closing in on midnight. The KEFs had been swapped out for the Spatial Hologram M4 Turbo S. SPLs were driven south in the interest of neighbourly consideration. With Lambchop’s languid Mr. M oozing from the Sonore microRendu over USB, an abundance of micro-dynamic flicker maintained listener focus. The Spatials rate as 93db efficient; they wake up earlier than your average standmount. In this context, tenderness and finesse were noted as the amplifier’s most conspicuous qualities. An audible jack of all trades; brawn and brains. What kind of voodoo was this? Drawing down on the less-than-reliable long-term auditory memory, the nova150 (US$1499) – the first new ‘super-integrated’ amplifier to spill from Peachtree Audio’s 2.0 regeneration – possesses little of the Nova 125’s or the (much improved) Nova 125SE’s sonic DNA. Peachtree Audio’s internal revolution has been largely driven from within by three key factors. Firstly, an all new lead engineer and team were appointed. Secondly, production was moved from China to Canada where the factory specialises in high-end medical equipment. Thirdly, returning to the fold after stints at AudioQuest, Tidal and Audioengine is one David Solomon. Solomon prefers to keep Mum about the identity of the new engineer as well as precisely how the two Class D ICEPower modules found inside the nova150 have been implemented. What he will tell us is this: a pair of 300AC modules are fed by an outboard SMPS running at 480kHz. De-sleeving the amplifier for a closer look-see risked damaging Peachtree’s signature curved-rectangular profile. I’ve chipped one before. This nova150 is piano black but Gloss Ebony and Santos Rosewood are available for an extra Benjamin. Peachtree Audio – U (still) got the look. This time out though we note a significant uptick in SNR: 111db from the nova150 as active pre-amp, 105db as an integrated. Gone for good is the defeatable tube stage that previously glowed blue on each Peachtree integrated’s front panel. A tube stage that Solomon asserts would take SNR down to around 88db had it been maintained as part of the new model’s design. No tube, no worries. The nova150’s back-panel tape loop will accommodate third party tube buffers for those who a) cannot possibly live without a 2nd-order heavy harmonic distortion profile and b) are therefore happy to surrender some of this amplifier’s price-category over-achievement in shining brighter lights into darker corners. The tube’s omission and the resulting “superior, quieter circuit” might provide one reason why Lambchop furnished the Spatial open baffles with the jump factor necessary for maintaining listener engagement at low listening levels. A more costly super integrated with similar levels of late night intimacy is the Vinnie Rossi LIO. With its tube-free Slagelformer pre-stage coupled to a 25wpc MOSFET speaker driver, the LIO’s better saturated tonal colours point us to why one might spend several thousand dollars on a uni-box but the nova150 makes the downward slope of that choice’s diminishing returns curve significantly steeper. The new Peachtree easily outmuscles its Massachusetts rival on specified watts per channel: 150wpc into 8 Ohms. What’s really interesting is how the nova150 feels more powerful in use than another super integrated, the Devialet Expert 200, even if it can’t quite match the Frenchman on separation and depth of detail retrieval. 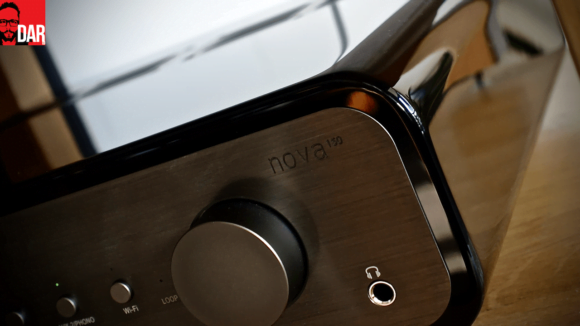 On overall gestalt, the nova150 sits closer to Devialet than the Vinnie Rossi. On signal gain, a total of 35db is split 6-29 between the nova150’s active pre-amplifier and power amplifier, the former by-passable via a long, 5-second push on any input selector. That’s useful for those who wish to divert volume attenuation to an upstream box – as I did with the DEQX PreMATE+ when adding a subwoofer to the picture – or when buying into a digital pre with superior-sounding conversion to the nova150’s ESS Sabre32 ESS Reference 9018K2M DAC implementation. However, as with its predecessors, the functional spirit of this smaller nova (that shares similar dimensions to the early Decco units) is one of inclusion: everything under one roof. 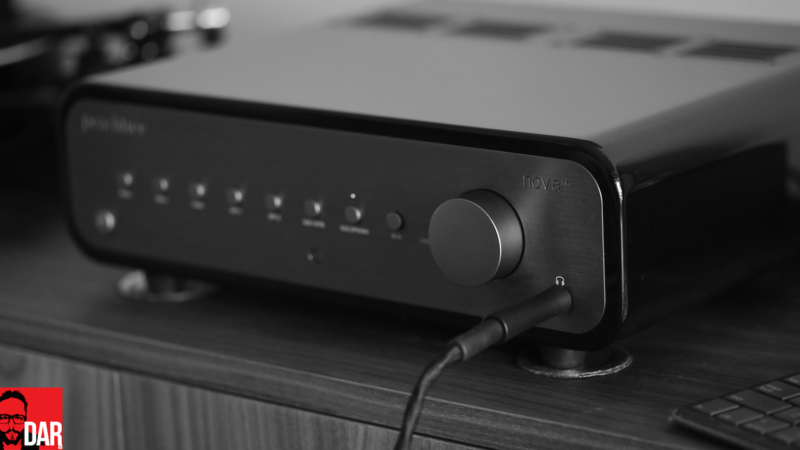 Better to maximise the sound of the nova150’s own D/A conversion with a Sonore microRendu – easily the best-sounding streamer heard to date by this digiphile – than sweat the ‘what if’ of third party DACs strapped to one of its two line-level inputs, one of which doubles as HT bypass (which I don’t do) and the other as an MM phono stage (which I do do). “Peachtree Phono sections are full analog with separate power supplies and a proper RIAA analog circuit,” said Peachtree’s supporting .pdf. With zero price-appropriate external phono boxes to hand, I can only express my enthusiasm for Peachtree’s internal board in noting how it exposed the clear superiority of the Rega RP8, fitted with Zu-modded DL-103R and step-upped by a Graham Slee Elevator, over the Pioneer PLX-1000 w/ Dynavector 10×5 and, more emphatically, the Rega RP1 with factory-fitted Carbon cart. Over on the other side of the fence, digital inputs runs a follows: a pair of S/PDIF TOSLINK sockets were populated with outputs from Google Chromecast Audio and an Apple TV; a USB B socket that readily exposed the Roon Ready microRendu’s superior sense of ease and space, wiping the floor with the considerably more functional&friendly AURALiC Aries Mini (running v3.x firmware). 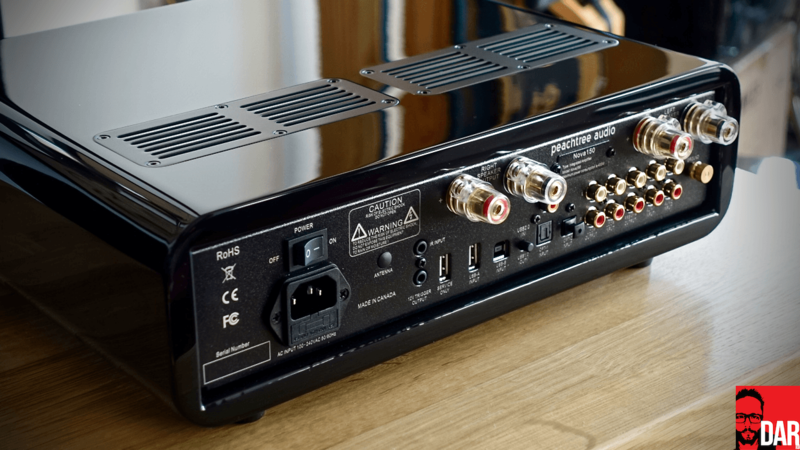 The nova150’s S/PDIF coaxial input remained vacant throughout this review. That brings us to (for me) the nova150’s killer feature: Peachtree’s Dy-NEC USB A input is for digitally siphoning ones and zeroes from suitably equipped smartphones and tablets – that means current iOS devices hooked up via Lightning-to-USB cable or selected Androids + intervening OTG cable. They’ll recharge as they play. In handing over D/A conversion to the nova150, we bypass the smartdevices’s inferior DAC and 3.5mm-terminated headphone output whose days in iPhone-land are numbered anyway. Handling the incoming data stream asynchronously, Peachtree claim their Dy-NEC input to be a world first in eliminating electrical noise spilling from the upstream device’s screen and/or power supplies. According to David Solomon, Apple’s Retina displays and their super high refresh rates are especially noisy. In practice, a Tidal-streaming iPad connected to the Dy-NEC USB A input easily aced the neighbouring Google Chromecast on acoustic mass and layer delineation; the differences were anything but subtle. Furthermore, Tidal’s iOS app plays gaplessly – just like the CDs it replaced – whereas its Google Chromecast Audio implementation does not. Taking my Dy-NEC fuelled enthusiasm further still is Peachtree’s supplied remote control, one that sports basic iDevice control – play/pause, forward/next – on top of the more usual volume attenuation and source selection. Gapless playback is also what separates Spotify’s iOS app the Google dongle. With iPad hooked up to the Peachtree amplifier’s USB A port, remote control is executed from any device running the Spotify app. For this user, that meant couch-bound control of The Stranger Things soundtrack from the comfort of the couch with iPhone and/or the work desk with the MacOS app. These software-based remotes one-up the infra-red wand with search, browse and radio etc – I switched over to Lana Del Rey’s Honeymoon without ever touching the iPad. And if all of the above isn’t enough to convince you that the nova150 is perhaps Peachtree’s best amplifier to date, consider its headphone section: it isn’t resistor-dropped from the main circuit, a method used elsewhere, even by Peachtree 1.0, as a cost-cutting measure. It often leads to high output impedance and all too often fails to deliver the requisite go juice required by thirstier cans. The nova150’s 6.4mm headphone socket is backed by separate amplifier that promises up to 11.5V to any connected headphone. Its single Ohm output impedance drives not only the Sennheiser HD650 with alarming ease but also the newer HD800S, coming up only slightly shy of the soundstage width and separation delivered by the US$5000 Resonessence Labs INVICTA (running single-ended) – a discovery that led to one of those super-rare, you-gotta-be-kidding me moments. The Vinnie Rossi, with balanced XLR output, is possibly the pick of the bunch in a contest more closely fought than one would expect with a US$1500 integrated thrown into the mix. A timely reminder that the chromed-up Devialet slabs don’t do headphones at all. As compensation, they instead specify a built in network streamer. 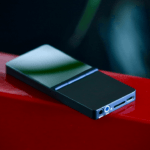 And yet, an optional wi-fi streaming module will soon arrive at the nova150’s door, as well as the beefier, better specified nova300 and nova500 set to drop some time later this year. Fingers crossed that this module lands Roon Ready. Even with streamer subtracted, Peachtree 2.0’s starter unit maxes out on bang-for-buck like no other model before it. Matching the nova150’s performance and feature set with separates would be a snipe hunt. The nova150 is also for minimalists; those who don’t have the lounge room real estate for – or the time to research and compile – a hifi rack full of separates and tidy its associated cable melange into something halfway presentable. It’s also for renters who move house more often than their mortgaged peers. One box, pack n go. This newcomer is also for those who care about looks as well as performance. Almost ten years on from the company’s inception, Peachtree Audio’s amplifiers remain peerless on outward appearance. One could be forgiven for buying one on looks alone. Inside though, this model is all wheat and no chaff. 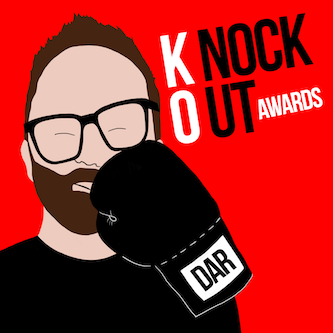 A DAR-KO Award is hereby assigned without second thought. Thanks for another insightful review John. As a fellow Devialet owner I’m looking forward to hearing more about the microRendu feeding your 200 (though your aside in the article seems to have answered my question already). And just a note that as far as I’m aware all Devialet units except the 120 can be configured to run headphones – see https://help.devialet.com/hc/en-us/articles/203402451-How-to-connect-headphones- It’s not an easy plug-and-play though. For the 120 the required preout module appears to be available as an optional extra. As always, a very well written article on very well designed and implemented gear. One small revision; the ICEPower module used is the 300ASC. I’m pretty sure it’s a pair of 300AC – the power supply is separate. I confirmed as much with Peachtree. This is definitely on my radar as new amp for the LS50s. I know you liked this amps features but how did it perform with the LS50s? Better than the Nova220? Would appreciate any thoughts on the pairing. I noticed NAD just released a competitor. The C388. Maybe a comparison somewhere in the future? Not likely at this stage – sorry. I use the nova 150 (2ndry computer system)with LS 50 on 24″ pangea audio steel stands with Kimber Kables 8TC in a near field situation they sound wonderful very clean , neat and detailed and in a room 11X10 , don’t need a Sub-woofer, also use the newly acquire LCD 2 with the Headphone jack but have nothing to compare it except Bose & kef M100 buds. but they do very good I dont think I need a separate headphone amp. I have one and drive the Kefs on Custom Design FS 104 Stands. Kimber 4TC. 16 * 21 Ft room. Great combo. Boogie and sparkle. I’ve gone back and forth w a Sumiko S9 sub, but ultimately prefer the LS50’s alone. The IOS port is great. Do you think this Peachtree would drive Martin Logan hybrid electrostatics well? Class D doesn’t like transducers that dip down to 0.5 ohm, so I’m told. But golly I like the looks and idea of the Nova 150. Not sure on that one without actually trying it. Hi Bradley, No problem with the ML’s impedance. But depending on how loud you listen and which model, the nova300 may be a better bet. We used the prototype 300 to drive the Summit X at Axpona and it worked very well, although we were totally cranking it beyond where most rational people would go. Cool review. I was hoping to hear more about how the Peachtree’s pair with the Hologram M 4s though, I am waiting for delivery of my M4s at the moment. Long term, my upgrade path is as follows. Peachtree Nova 150 initially, adding an REL T7i subwoofer, then running the nova I power amp mode when I can afford the deqx pre mate and beyond that a dedicated power amp such as the red dragon. Id be interested to hear your thoughts. I’d love to see a comparo between the Nova150 and NuPrime IDA-8. That won’t come from me – sorry. Yeah, which is a shame. Nuprime doesn’t seem to be big on sending units out for independent review. Regardless, the few reviews that our out there are very positive. If it’s the same guys that handled NuForce gear, the one and only time I sought out a review unit in 2013 I was asked to pay for outbound shipping and tax in exchange for a free unit. I took a pass. Yes Love the unit(Nova 150)with Kef LS 50 in a near field listening enviroment its ” match made in Heaven” ! of late have been testing them with new MMG on triall & a HSu sub.VTF-15 MK 11 but saw a post by David Soloman – Nova 150 matched with magnepans 1.7 so I have ordered a pair of 1.7i but I wonder if ICE-module power can support the high current requirements of the Maggie 1.7i I am thinking of getting the Parasound Halo or the A21 any advice would be appreciated ! Hi Asghar, The nova150 is pushing my 1.7’s in a 25 x 32″ room and having no problems. It’s wonderful. Steve Gutenberg reviewed the 150 w the LS 50 and the Magnepan .7. 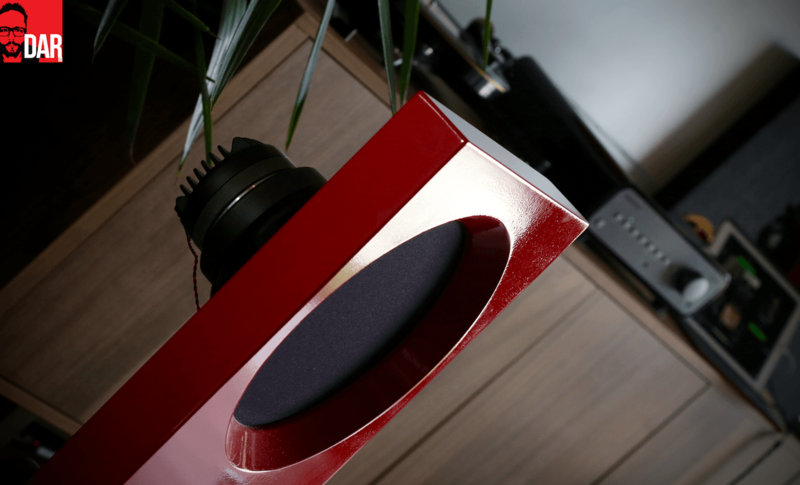 ” Pairing the Nova150 with my KEF LS50 speakers seemed like a good idea, and it was. The LS50’s razor sharp imaging was a treat, and the speaker seemed a little clearer and more dynamic than I usually give it credit for with digital sources. Spinning LPs with a Rega Planar 3 turntable the Nova150’s sound was invitingly rich and full, but I wished it summoned up a tad more detail. “The Nova150 was an even better match with my Magnepan .7 flat panel speakers. The .7s crave power, and the Nova150 delivered gobs of it. Bass definition and oomph were truly exceptional, better than I’ve heard from the .7s mated with other integrated amps. The speakers transparency shined ever so brightly, and since the .7s are almost five feet tall their sound was closer to life-size than any bookshelf speakers, or even most comparably-priced tower speakers could produce. David , thanks , appreciate the feed back ., I ended up pairing the Nova 150 with my LS 50 in my home office and purchased the Parasound Halo to run my new 1.7i although the Nova 150 did push the 1.7i , with no issues how ever the magi 1.7i do seems to like the high current amplification of the the Parasound with more detail and clarity at least to my ears. ! Amazing. The Ebony finish is sold out on several retailers here in the USA. I went for a $800 Cambridge Audio CXA-60 and Aperion Verus Grand Bookshelf speakers. I couldn’t swing the $1600 needed for the Peachtree, or the $1300 for a Rogue Audio Sphinx + external DAC. I own a nova125se and I’ve been eagerly awaiting reviews of the 150. I quite like the 125, but the new DAC and phono input of the 150 have me intrigued. Also, peachtree has made a lot about thr SNR of the 150 in their marketing material. John, how does that higher spec manifest itself in the sound? Also, how do you think the DAC compares to the Schiit Gungir multibit? Thank you. Pretty sure I touched on that in the review. Not going to linger on it though as the Spatials aren’t the subject of the piece. 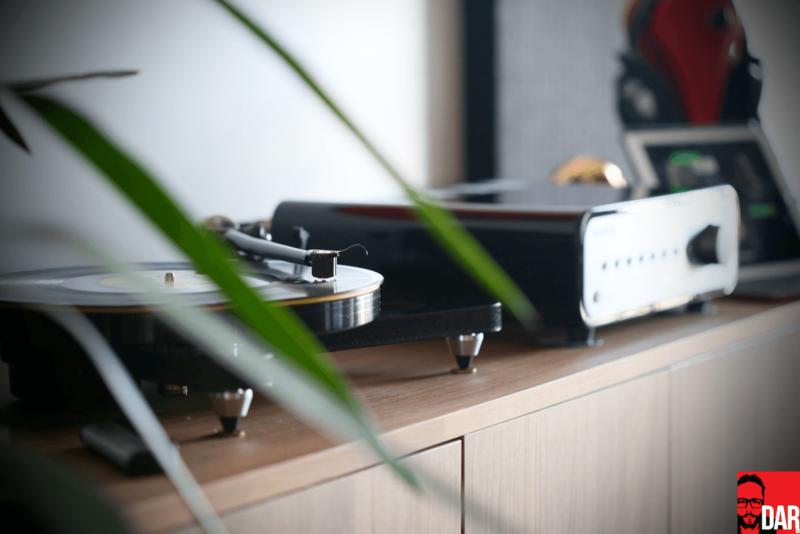 Ditto Rega RP8 and microRendu. Thanks john, but i didn’t ask about the source components. I was very curious as to your opinion of the 150 DAC compared to the gungir. Thanks again. I didn’t conduct that comparison – sorry. Thanks for another great review, John. We’re all very lucky to enjoy your coverage…..and for free! Hey Graham. Due to time constraints in reviewing each piece, all that I have to say is contained within the review. For a single purpose product I can go deeper but this amp points us in numerous directions. Peachtree have a well organised and extensive dealer network so auditioning one for yourself shouldn’t be too much of a hassle. Great review as always! Can you hook up two subs and use the home theater bypass on this all at the same time? Love the look and bang for the buck ratio on this integrated! Not sure – as I said in the review, I don’t *do* HT bypass and all that goes with it. Maybe hit up Peachtree with the question directly? No, unfortunately you cannot bypass for the sub. Hi John, one sentence in your review has rung a bell “According to David Solomon, Apple’s Retina displays and their super high refresh rates are especially noisy”. As a hobbyist sound engineer for 14-year I know that 99% of the recording industry uses HDD with or without computers and displays (the Pro Tools system being the most famous one). I’m not saying that Mr Solomon lies. I’m just wondering why nobody in the recording industry worries about computer screens and SMPS polluting the audio signal. The most current chain in the industry is mic > mic preamp > ADC > HDD and/or computer. Furthermore all of the post-production work is made using computer screens and PSU. So have audiophiles and playback equipment manufacturers better ears? Or have manufacturers excellent marketing skills and audiophiles being a bit too naive? Sorry to use DAR as a bridge between my questions (and maybe some of your followers? )and the hifi industry. So here’s the story behind the DyNEC system: The nova150 and 300 were in prototype form. We had all heard them, and were really taken by the totality of the product. I listened to the iOS input, but at the time was more interested in the USB and phone section and spent much of my initial time listening there. Until… Axpona where we were using Martin Logan Summit X (very revealing). For convenience, I started using TIDAL on the iOS input for three solid days and noticed it sounded like a real component. I didn’t say anything to my partners other than, wow… this input sounds amazing. A few weeks later, I did the Newport show and used the Wilson Sabrina…again for three days and noticed the same results. He went on to explain that he had a circuit that dynamically tracked and eliminated noise. This is a very abridged version as the conversation lasted a long time, but that was the gist. He wasn’t even going to say anything, but me… as a partner, and in marketing for the company felt we needed a personality for the input, so was born DyNEC. It is a full circuit designed for this reason, because our engineer is perfectly OCD. Chris Connaker at Computeraudiophile came up with the same experience as me, on his $45k TAD speakers. So no, I’m not lying or making stuff up to go to market. The nova stands on ts own even without the iOS. This was a discovery I made after careful listening to this input and realizing it was as performance oriented as it was convenient. BTW, the reason you may have never heard of anything like it is because no one else is doing it. Manufacturers don’t typically bring up issues they haven’t dealt with. iOS input sounds good, Mister Solomon? I would certainly kick off feeding the Nova ALAC and AAC files from an iPod Touch and iPhone. Great review, good read. You mention Aries Mini and microRendu. Did you listen to the Aries Mini with 4.0 firmware? It really makes a big difference. My comparison was done BEFORE fw v4.0. Need to revisit. I second that. To my ears there is a clear improvement with the V4.0 update on the Mini. Not sure how I missed saying thank you to John Darko on his own site. This was so much fun to read and love the poetic flow. The time and effort you spent is much appreciated, John. What other amplifiers have you tried with your M4 Turbo S, which are cheaper than the Peachtree nova? I am trying to buy an M4, but am looking for a cheaper amplifier. The NAD C338 has my attention, it will be out next month. Excellent, informative and well written, as always. I had an opportunity to hear a nova150 at my local dealer in NYC paired with Focal Aria 926, and the combo was really quite impressive. I have to say however that, having owned a Grand Integrated for years, I find the Grand a tad better in terms of overall sound quality – at least to my ears. Using digit sources, I find the sound warmer (maybe is it just a way of saying ‘lower S/N’ in acoustic terms, but it just sounds more musical to me…), equally detailed, and the top-class volume control of the preamp section in the Grand offers, in my memories, even better, sharper imaging. This said, my Grand is now gone from my listening room – replaced by a Devialet – and the nova150 is my #1 choice for my office space – by far. I am very curious about this wifi streaming module that Peachtree has announced, any update on its release date? Thanks a lot! 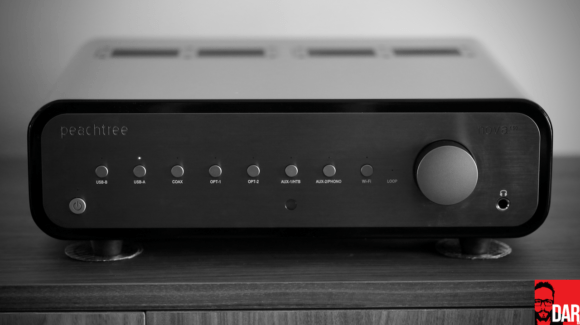 Hegel has dropped the price of their H80 integrated amp to $1599 to get more traction in the US market. Interesting, since it costs the same as the Peachtree nova150 now. How Nova150 pairs with Chario Lynn speakers? How does it compare against a very old Marantz PM-17 KI Series in the stereo amp section?